Our shed treatments and accessories will help your garden shed last longer and stay tidy. We stock a wide selection of shelving to make the most of your garden storage space, and keep your shed clutter free. Our superior-duty felt and timber treatments will keep your shed protected from the elements and looking its best on the outside. Protect your valuable equipment and property with the Sold Secure pad bolt. Hacksaw and drill proof it is made from rust resistant, hardened stainless steel and affixes through the door and framing with concealed fixings to prevent tampering. Suitable for fitting to both left and right handed doors, it will keep your prized possessions safe and secure. Comes with a 5 year manufacturer's guarantee! This Superior quality, Charcoal heavyweight felt is 50% thicker than standard felt, with a glass fibre and bitumen base. This 4ft triple tier wooden shelf set provides the ideal storage solution for keeping your garden shed clutter free. Keep your garden building secure with Waltons Shed Sensor Wireless Alarm. This wall mounted sensor alarm is ideal for protecting your garden building. Our shed alarm features a 105 decibel alert and can detect movement within a 110 degree range. The battery operated alarm features an easy installation system and is supplied with two remote controls. This 5ft double tier wooden shelf provides the ideal storage solution for keeping your garden shed clutter free. This 4ft double tier wooden shelf set provides the ideal storage solution for keeping your garden shed clutter free. This 3ft double tier wooden shelf set provides the ideal storage solution for keeping your garden shed clutter free. This 3ft triple tier wooden shelf set provides the ideal storage solution for keeping your garden shed clutter free. This Grand Storage Shelf Kit is a great addition to this garden building and offers a useful storage option for all your smaller items, such as trowels, pots and gardening gloves. This shelf is created using 12mm tongue and groove timber, you can be rest assured that this storage shelf can withstand a great deal of weight without losing shape. Why not buy a couple of these kits so you can have multiple shelves in your shed? Everything you need to get this kit securely fitted is included. 4ft Waltons Double Tier Wooden Shelf Set - Free Next Day Delivery! This sturdy and spacious shelf set is perfect for outdoor storage and offers a strong base for keeping your shed neat and tidy. 3ft Waltons Double Tier Wooden Shelf Set - Free Next Day Delivery! This strong and robust shelf set is ideal for keeping your shed neat and tidy, with plenty of storage space. 4ft Waltons Triple Tier Wooden Shelf Set - Free next Day Delivery! This 4ft Waltons shelf set is great for keeping your shed looking neat and tidy and adding some extra vertical storage to your garden buildings. 5ft Waltons Triple Tier Wooden Shelf Set - Free Next Day Delivery! 5ft Waltons Triple Tier Wooden Shelf Set - Free Next Day Delivery! This shelving set is made from 16mm tongue and groove timber for extra support. 5ft Waltons Double Tier Wooden Shelf Set - Free Next Day Delivery! This strong and robust shelf set is ideal for keeping your garden buildings neat and tidy, with plenty of high strength storage space. 3ft Waltons Triple Tier Wooden Shelf Set - Free Next Day Delivery! 3ft Waltons Triple Tier Wooden Shelf Set - Free Next Day Delivery! This shelving set is made from 16mm tongue and groove timber for extra support. 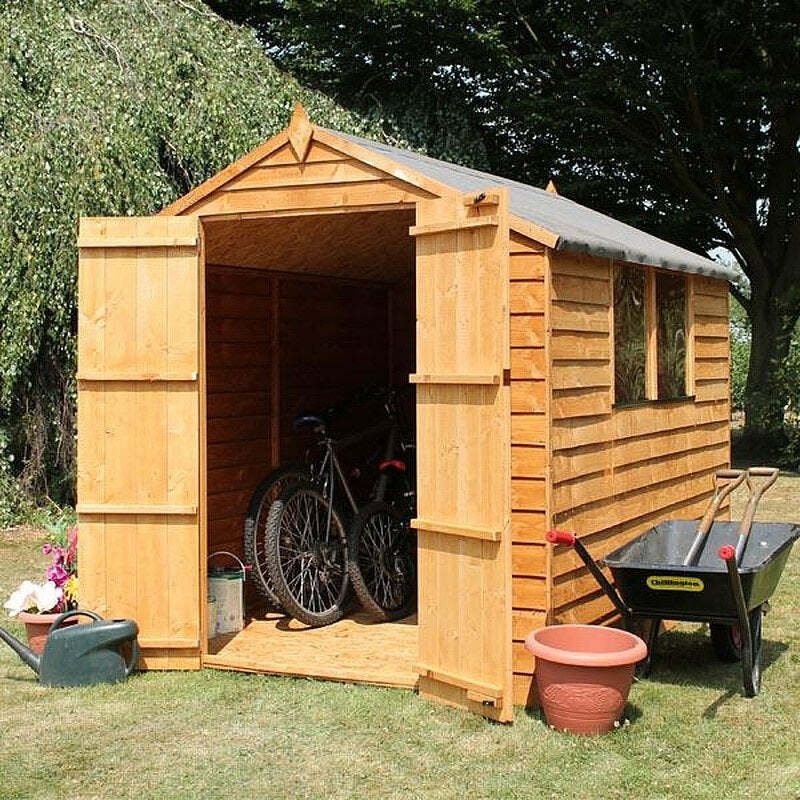 This Wooden Side Shed provides a great place to store garden furniture and bicycles when a separate garden building isn't necessary. Thick 12mm tongue and groove cladding slots together to create a weatherproof structure that will protect your possessions from the harshest of weather conditions. A large double door makes storing and retrieving items easy work, ideal if you intend on keeping bulkier items inside. The great thing about this Side Shed is that it has been specifically designed to attach to our 7 x 7 Corner Summerhouse, meaning you don’t have to worry about compatibility issues. Please note: This is side shed only, none of the additional tools are included.